Stronger tool made to handle a larger chip load. 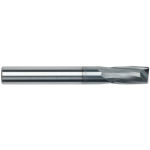 Out performs standard end mills. Higher speeds and feeds without compromising longevity.